With Diwali coming soon it is time to keep in stock some home remedies for stomach upset and digestion. 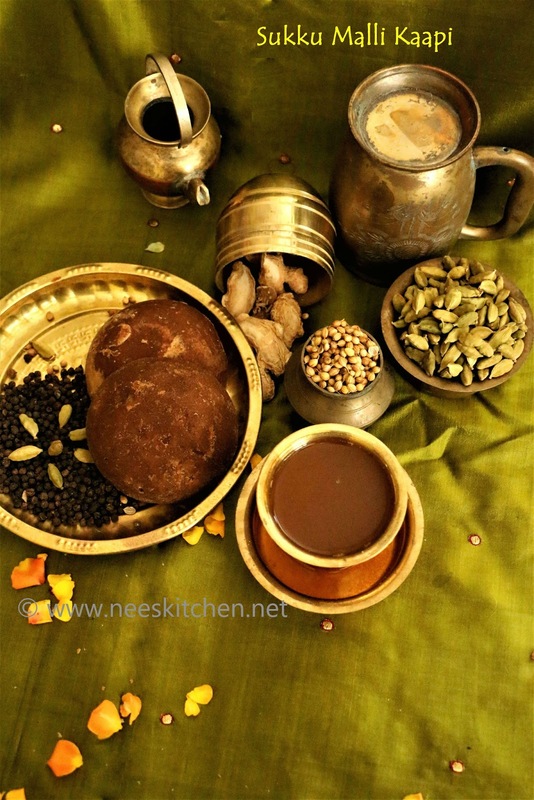 Sukku Malli Kaapi is one such recipe which is quite easy to make with ingredients readily available in our kitchen. This recipe also helps to heal throat pain and cold related symptoms. Pepper, Cardamom ,Coriander Seeds,Dry Ginger are recommended in Ayurveda for healing stomach upsets and common cold symptoms. Sukku Malli Kaapi is a combination of these spices and having them in stock during festive seasons and winter is a must. 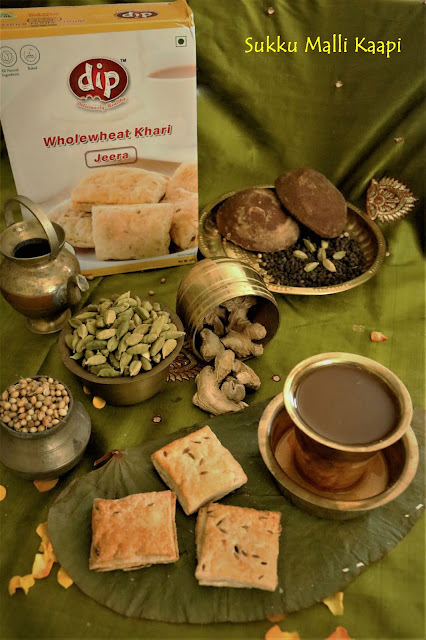 It has been raining in Singapore on and off and last evening we had Sukku Malli Kaapi with DIP Food’s Jeera Flavored Whole Wheat Khari as our evening snack. The combination of Khari and Sukku Malli Kapi balanced our craving for a snack during a rainy day and soothed our throat. DIP Food’s Whole wheat khari is a perfect and healthy tea time snack. It is baked and has Whole wheat flour as its main ingredient. I have been reviewing DIP Foods over the past 1 year and time to time they have improved in the taste and packaging. Khari is crispy and flaky and I was very happy with the packaging of this product as it did not see any broken pieces. 2.Take a mortar pestle or mixie and first pound the dry ginger to a coarse powder. 3. Add the spices to the dry ginger powder and pound again to get a coarse consistency. 4. Sukku Malli Kappi Powder is ready. Store them in an air tight container. 6. Grate the palm sugar or jaggery. 7.Take a heavy bottom vessel and add water and grated palm sugar or jaggery. Boil them till the jaggery melts. You need not remove the scum as we will be filtering them at the end. 8. While it starts to boil add 1.5tblsp sukku malli kaapi mix. 9. Bring to a boil and reduce to almost half its original quantity. A lovely aroma will be released by this time. 10. Turn off the flame and filter the Sukku Malli Kappi and serve hot.